ADOPTED: I have found my forever home!! I have a wonderful new mommy,daddy, 2 brothers (1 four-legged) and 3 sisters (1 - four legged) they know the real meaning of forever!! My new family!!! I LOVE my new family!!! My owners drove 9 hours to bring me to Harlequin Haven so that I have a chance at finding a forever home. They realize now that they did not research what they were getting themselves into when they purchased me for $1250.00. 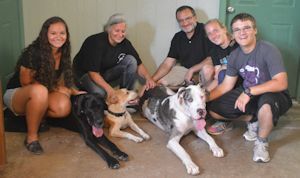 They saw a pretty website, read the guarantee and even saw that they were "ADOPTING" not buying!!! They really thought they were doing everything right! Well now they know better!!! Okay folks 1st thing is when you go to a breeder you BUY a puppy you are NOT Adopting!!! Breeders are in it for the money or to better the breed and well breeding hearing impaired/deaf Danes is not to better the breed!!! Anyone can have a pretty website that does NOT mean they are reputable!! 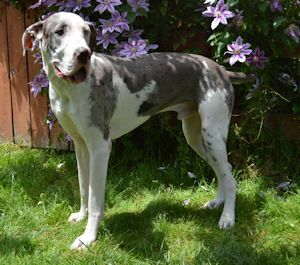 A reputable breeder does NOT breed hearing impaired/deaf Danes or any defect for that matter!! A reputable breeder will NOT claim you are Adopting a dog!!! Gee look the definition of adoption up in the dictionary if you do not believe me!! A reputable breeder will always take their dogs back no matter what the reason!!! Yeah you guessed it my breeder refused to take me back which is why I ended up in a rescue!! Guess that guarantee did not cover hearing impaired or deaf!! My owners did not feel that they were able to deal with my lack of hearing when the new baby was born. I am now settling in here at the rescue my owners brought my food, treats, toys and bedding that smells like home so that is making my adjustment easier and my new best friend is Pryce he also just arrived!! Plus Grandma here at the rescue gave me a bunch of new toys and stuff to play with!! Update: I have great news!! I am now ready for adoption!!! 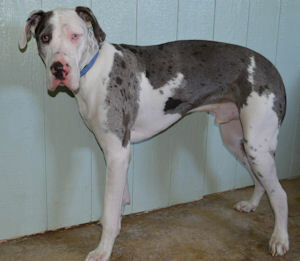 Are you wanting a deaf Dane to snuggle with?? I have added some new pictures below to show you how handsome I am!! Update: Well today Rona and I went to the Animal Audiology Clinic and it was exciting!!! We got to go for a long car ride then we went into this really big building and even rode on an elevator!!! Rona went first and when it was my turn they stuck me with 3 tiny needles and then they put like an ear pod in my ears 1 at a time of course. And a few minutes later it was confirmed I am deaf. The doctors called it bilateral hearing loss but when Grandma asked they said deaf. The Doctors were shocked that a breeder would sell a deaf puppy and that it took coming to a rescue to have my hearing tested. Apparently the breeders they see at the clinic are more reputable then mine! 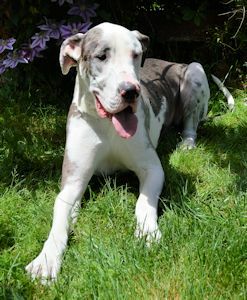 But they did admit they had not seen any litters of Dane puppies and were shocked that deaf Danes were so common.